A SOUNDWALK ALONG the rue de la Convention in the middle of a busy Saturday afternoon doesn’t I’m afraid reveal some of the more intriguing and delicate sounds sometimes to be found in Paris. It does though reveal sounds that are familiar to all city dwellers and typical of all too many Parisian streets so I thought they deserved to be recorded. 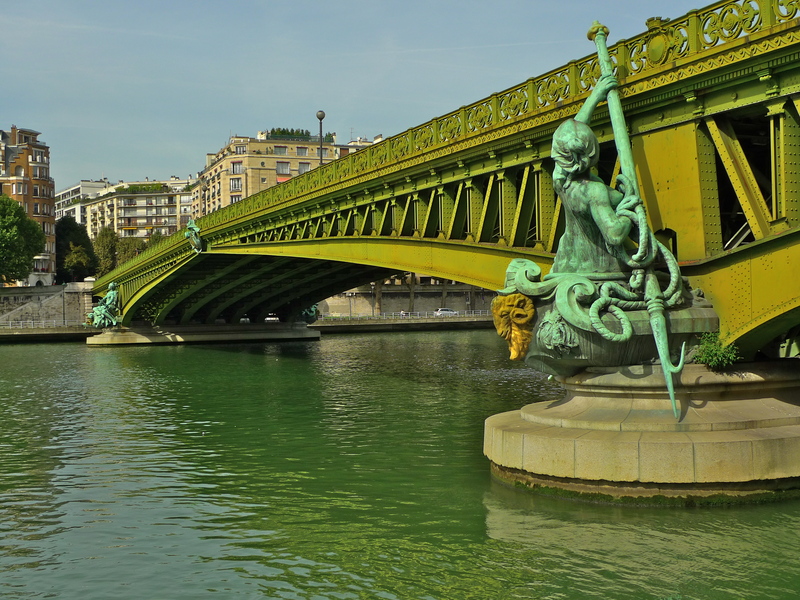 Rue de la Convention begins at the elegant Pont Mirabeau and stretches for a little over 2km to the southwest to Place Charles-Vallin. The whole street is in the 15th arrondissement and it takes its name from the Convention Nationale, the revolutionary assembly that sat from 1792 – 1795 and which, amongst other things, abolished the French Monarchy and set up the République. 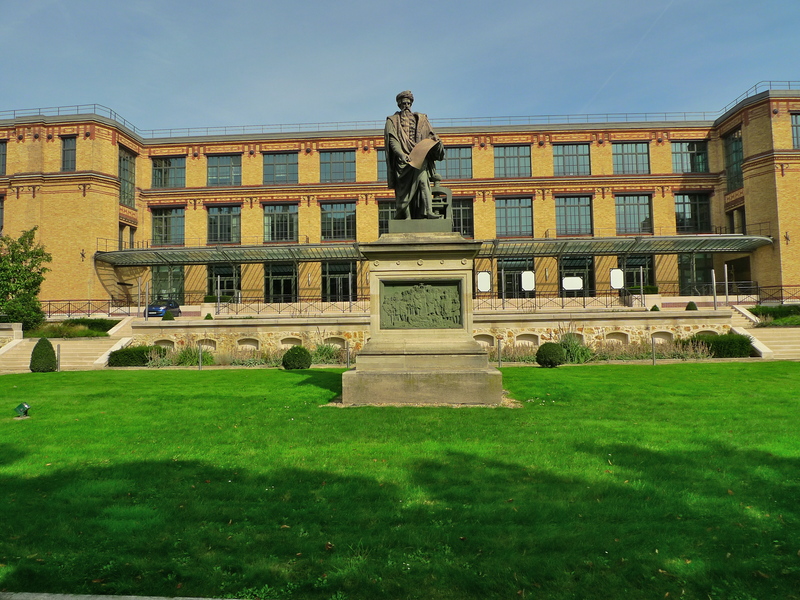 Some places of interest along the street include, at N° 27, the site of the former Imprimerie Nationale. Founded by Cardinal Richelieu this used to be the official printing works of the French Government. 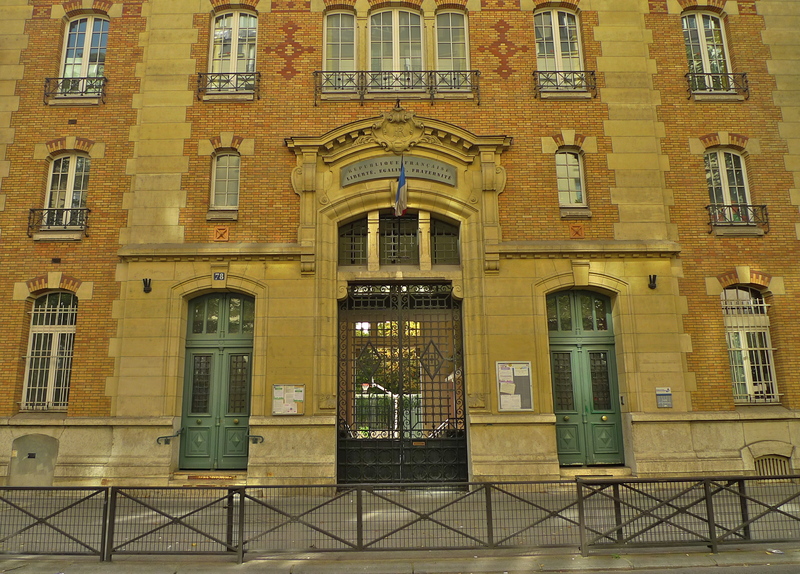 The Imprimerie Nationale ceased to operate from this site in 2003 and the French Government sold the printing machinery to a French printing firm and the buildings to the Carlyle group for 85 million euros. In a staggering display of ineptitude, the same buildings were repurchased by the French Government in 2007 for 376,5 million euros for use by part of the Ministère des Affaires étrangères, the French Foreign Ministry. 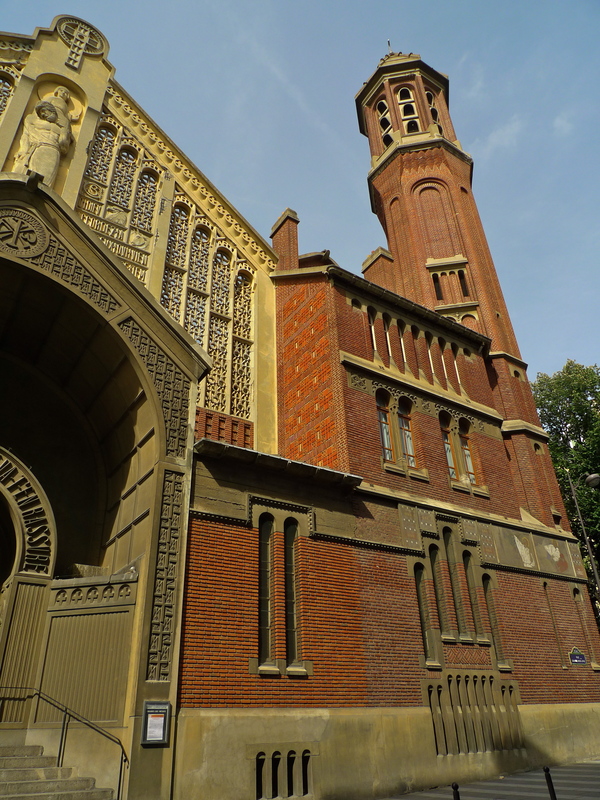 At N° 28 is the église Saint-Christophe-de-Javel. 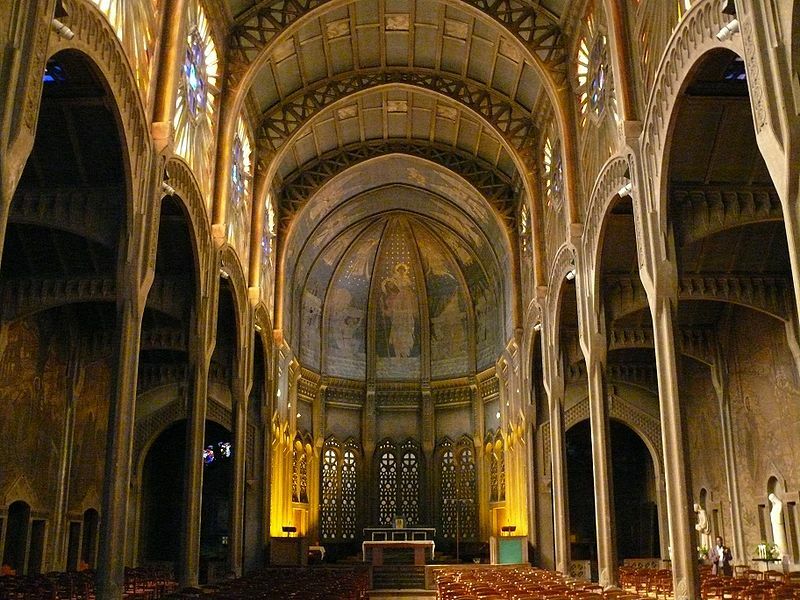 Designed by the French architect, Charles-Henri Besnard and consecrated in 1930, the church is built in a modern style making extensive use of reinforced concrete using a method patented by Besnard a few years before. Further along rue de la Convention we come to N° 78. Today it’s a school and cultural centre but it was once the Hôpital Boucicaut. Marguerite Boucicaut, wife of Aristide Boucicaut, founder of the first department store in Paris, Au Bon Marché, funded the building of the hospital. It was opened in 1897 with 206 beds some of which were reserved for employees of Au Bon Marché. The Hôpital Boucicaut was finally decommissioned in the year 2000 when its services were transferred to the then brand new Hôpital Européen Georges-Pompidou. 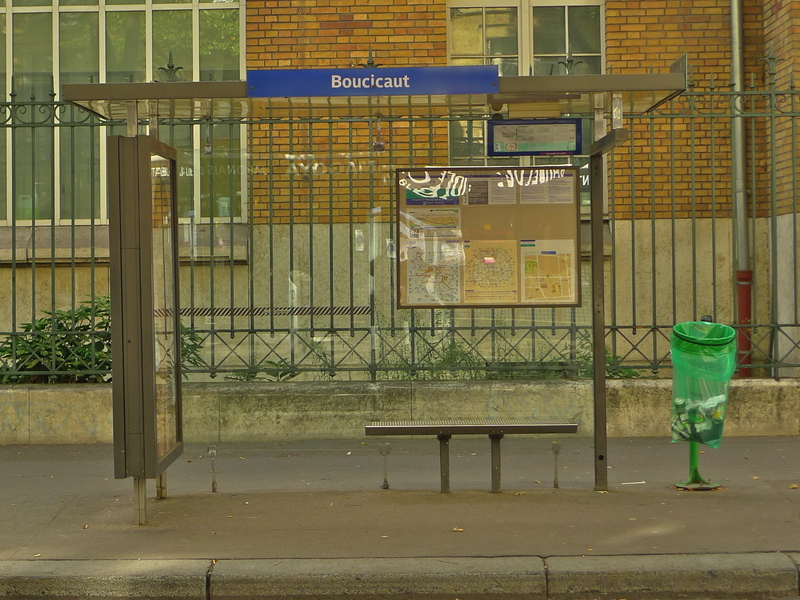 … this bus stop outside the former Hôpital Boucicaut and the Métro station a little further up the street. The rue de la Convention continues in a more or less straight line up to the next Métro station, Convention, where it crosses the longest street in Paris, rue de Vaugirard. Beyond the rue de Vaugirard, rue de la Convention goes up to Place Charles-Vallin where it terminates and morphs into the rue de Vouillé. 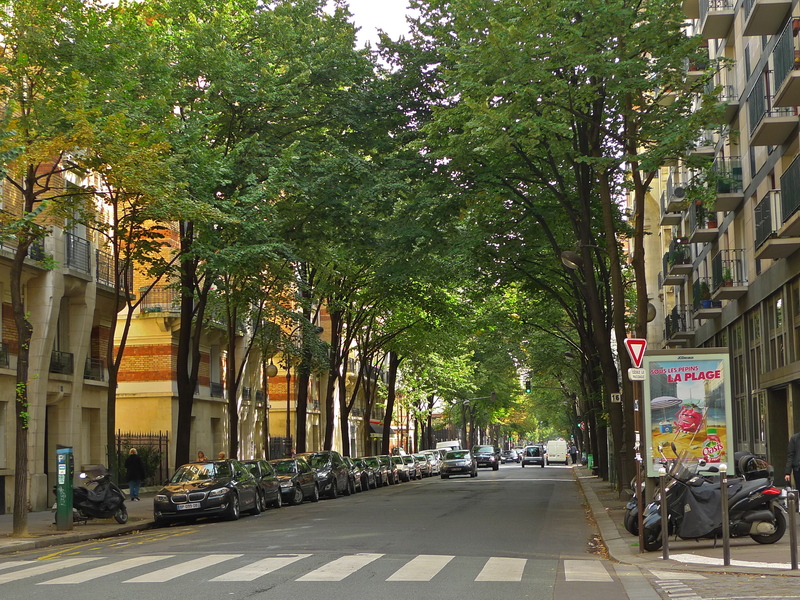 A soundwalk along rue de la Convention reveals a sonic environment typical of many Parisian streets. The ordinary but often interesting and intriguing everyday sounds are shrouded in a cloak of unremitting noise pollution – and I use the word noise advisedly. Take the sound of traffic for example. In my experience, certainly in this city, the quantity of sound emitted by the traffic seems to expand in proportion to the width of the street and as it does so, the quality of the sound deteriorates. 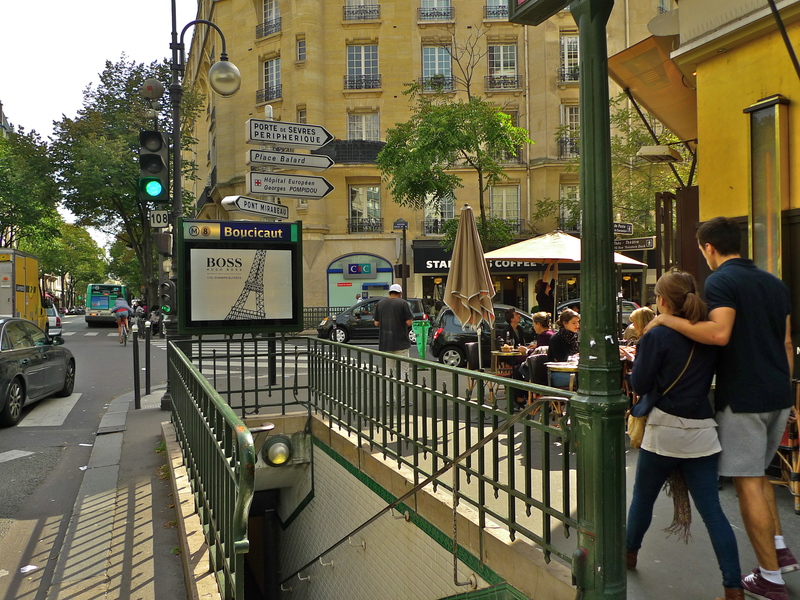 In some of the narrow streets of Paris the sound of the traffic can actually be quite appealing. There’s often less traffic, it tends to move more slowly and the sound of rubber gently swishing over the pavé can have a soothing, almost hypnotic effect. The rue de la Convention on the other hand is 34 metres wide and, although not the widest street in Paris, it’s wide enough to attract a copious amount of traffic moving faster than sometimes seems necessary. Consequently, the sound of the traffic loses any appeal to the ear and the individual traffic sounds that can be so attractive in a narrow, cobbled street, seem to meld into an amorphous mass of indistinguishable sounds that turn into unwelcome noise. Inevitably, the other non-traffic sounds get pushed to the margins or consumed altogether. So, why do a soundwalk in a street on a busy Saturday afternoon when capturing individual sounds is clearly going to be a challenge? Well, it’s precisely because it is such a challenge that I feel compelled to do it. There must be individual, interesting sounds there – there almost always are, so it’s simply a question of hunting them down. By listening attentively to the sounds around me and distinguishing the wheat from the chaff it is often possible to tease out distinctive, individual sounds from the cloak of noise pollution. And soundwalking is one of the techniques I use for capturing the sounds of Paris. It’s an immersive process that involves observing through active listening and it requires intense concentration. The aim of a soundwalk is to capture the mélange of sounds that create the atmosphere of a place and sometimes the individual sounds that might help to define it. A soundwalk of course never provides a definitive sonic definition of a place, sounds are dynamic, they change in tune with the time of day or night and the seasons of the year, the actors are constantly changing and the rhythm of activity ebbs and flows. But soundwalks are important because they capture the sonic experience of a place at a specific moment and listened to carefully they enable us to experience not only the obvious sounds but the less obvious ones too. When I do a soundwalk I don’t walk along a street with a microphone and sound recorder simply pointing and shooting, passively capturing the sounds immediately around me – although that is a perfectly legitimate way to do a soundwalk. For me, soundwalking is a very active and intense process. Instead of walking in a straight line pointing and shooting, I meander along the street capturing the general ambience but also exploring, hunting out the individual sounds and deciding how to capture them to best advantage sometimes against a hostile background of incessant traffic noise. Over the years I’ve learned how to employ this technique without interrupting the flow of the soundwalk. It’s all about acute observation, attentive listening and reacting quickly. 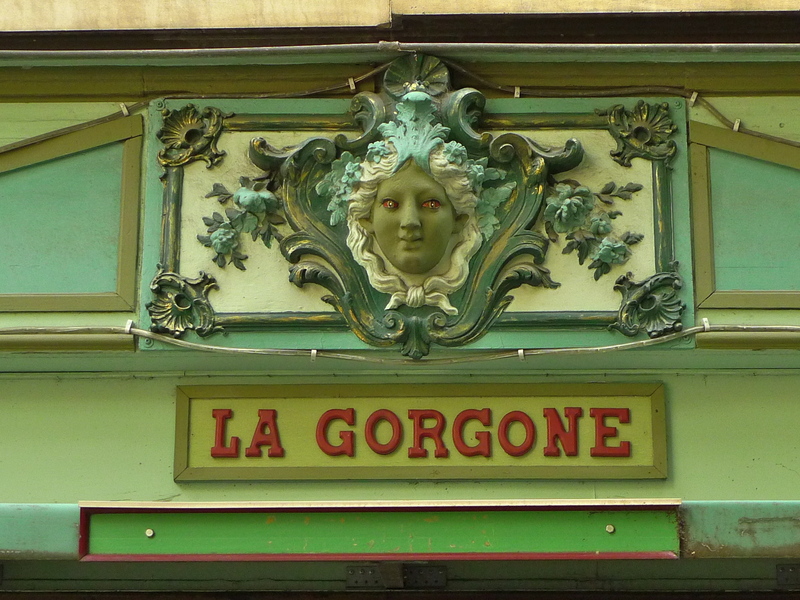 By now, you may have listened to my soundwalk in rue de la Convention. Actually, it’s only part of the whole soundwalk that I did. 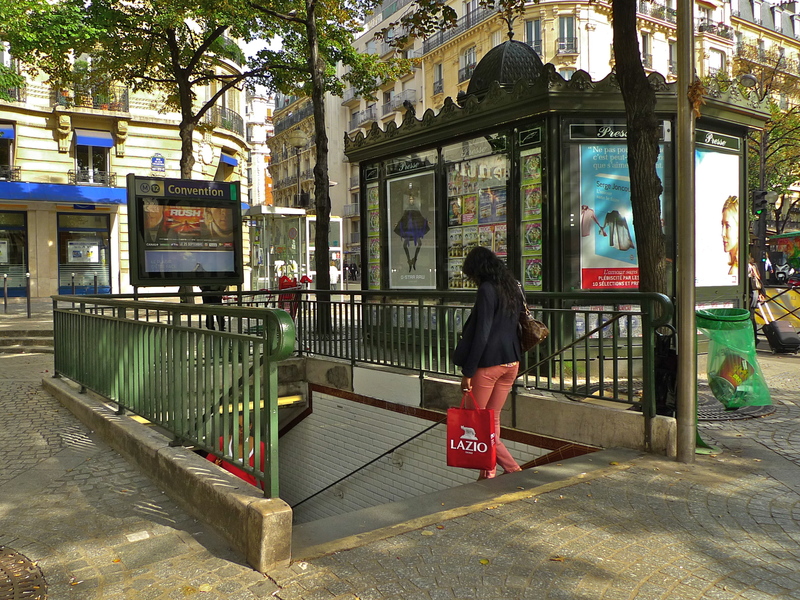 It’s the stretch from the former Hôpital Boucicaut to just beyond the intersection with the rue de Vaugirard – about one quarter of the entire street. At the start of the street at the Pont Mirabeau the traffic noise is interminable, it’s completely overpowering and there’s simply no escape from it. Coming up the rue de la Convention, the traffic passes in waves in tune with the traffic lights along the street. There‘s a brief intermission just beyond the intersection with rue de Vaugirard where the street narrows and then the traffic noise returns as the rue de la Convention approaches its end at Place Charles-Vallin. 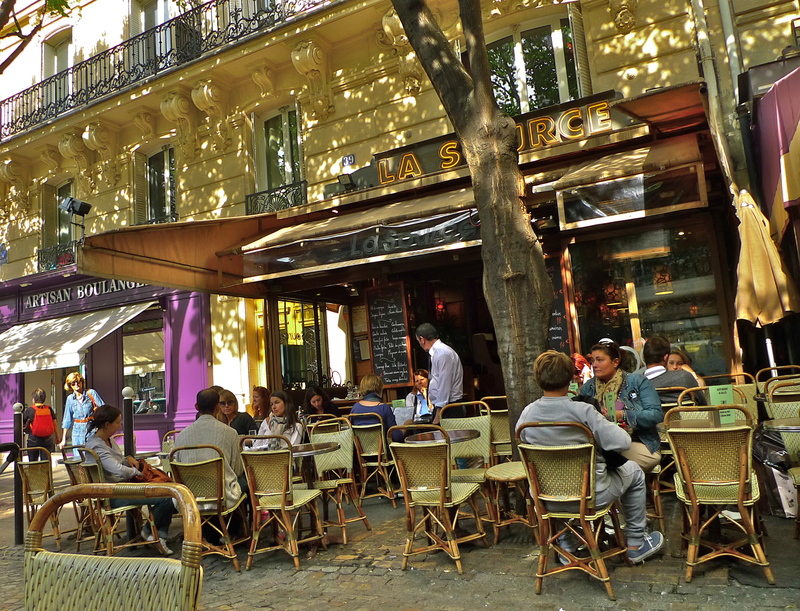 For this blog post I’ve only included the sounds of the intermediate section of the street because it gives the best flavour of the contrasting sounds to be found in the rue de la Convention on a busy Saturday afternoon. The recording of my entire soundwalk from one end of rue de la Convention to the other has of course has been consigned to my Paris Soundscapes Archive for future generations to explore and to study. Sitting in a café on rue de la Convention after my soundwalk I couldn’t help wondering why, in a city with such an exemplary and affordable public transport system, so many people should choose to use cars for inner city journeys and how many, if any at all, ever contemplate the environmental footprint they selfishly foist upon the rest of us. And finally … if you’re walking along any street whether you’re soundwalking or not, always remember to look up because fascinating things are often to be found above you.